Just outside the picturesque village of Grasmere, in the heart of Wordsworth Country, you’ll discover GRASMERE HOSTEL – and what a find it is too. 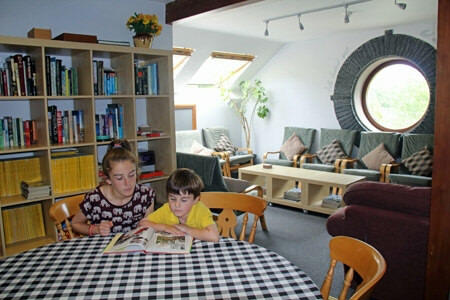 Part of Broadrayne Farm – which also offers self-catering cottages – this independent hostel is owned by the ever-helpful Dave Keighley and his wife. Situated alongside the A591, the main route from Ambleside and Grasmere to Keswick, the hostel is found behind the distinctive white farmhouse, at the foot of some very inviting fells; in fact, one of my favourite walks – the Fairfield Horseshoe – is easily accessed (well, it’ll take a steep climb to reach the crest of the fells but the effort is worth it). I stayed two nights in August with my wife and two children (aged 13 and 7) and we thoroughly enjoyed ourselves. 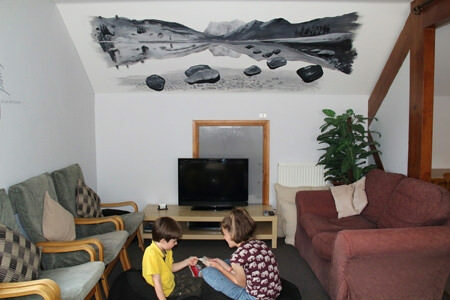 It’s a smashing hostel with lots of plus points, including all rooms being ensuite. When you’re travelling with kids, in particular, it’s great having your own bathroom and toilet rather than traipsing along the corridor during the night! Another positive was that our beds were already made up when we arrived, saving us that task – not always easy when you’re talking about bunkbeds. The Keighleys have spent plenty of time and effort enhancing the hostel’s décor and facilities; they’ve certainly done a good job. Outside, there are plenty of parking spaces and as soon as you enter the hostel, you’ll find loads of information leaflets showcasing local attractions and walks – helpful for those who aren’t familiar with the Lakes. A strong wi-fi signal is present throughout the hostel – and it’s free, too. There are two spacious kitchens with ample equipment and accessories; the dining area isn’t cramped either with space for 24 people. Upstairs, the TV lounge is, again, roomy with plenty to keep you occupied during rainy days or dark evenings. There are numerous books, games and a large flatscreen TV; alternatively, you can just stare out of the circular window towards Grasmere village and the fells beyond – it’s the striking feature in the room boasting a view to die for. Check-in time is from 4pm-9pm and departure time 10am from the bedroom, 11am from the hostel. You can arrive earlier and leave your car but the owners must be informed so that they know the vehicle is a guest’s car. Breakfast packs are available for an additional charge, and with ducks and chickens around the farm, fresh eggs can be provided for a small cost.